The Clutterbug - the obnoxious display of good design with a bunch of random - yet, "important" - junk. The majority of these rooms are esthetically pleasing to the eye, soft muted colours paired with white furniture, you really can't go wrong there. There's also some great ideas hidden in there, like magnetic chalkboard paint, or the brilliant use of IKEA storage towers to maximize office awesomeness. But then... there's all that stuff. 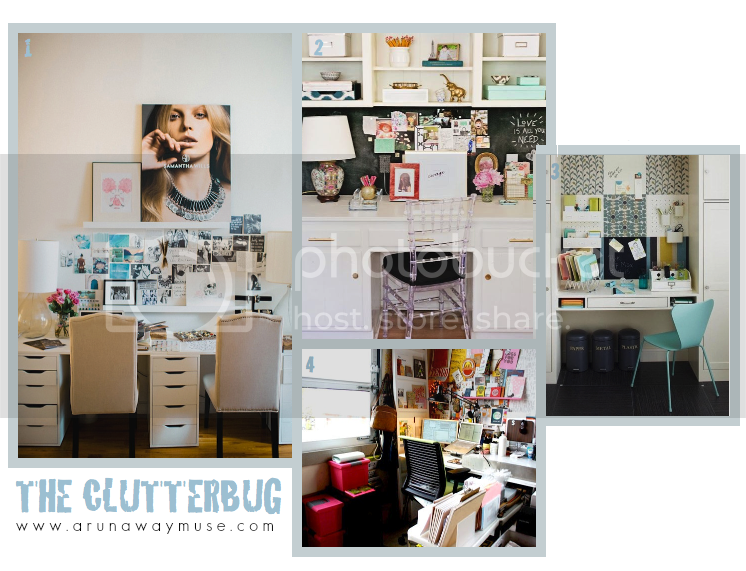 Not to be confused with the general population of "The Mess" design practice, where junk magically accumulates in a blink of an eye and is certainly not intended, the Clutterbug fully intends to fill their spaces with endless amounts of magazine clippings and sticky notes until every nook and cranny is filled. Serious sensory overload. I get enough brain activity from my computer screen alone, I couldn't imagine glancing up and staring at a busy scraps wall. Just thinking of it makes my eyes tired. 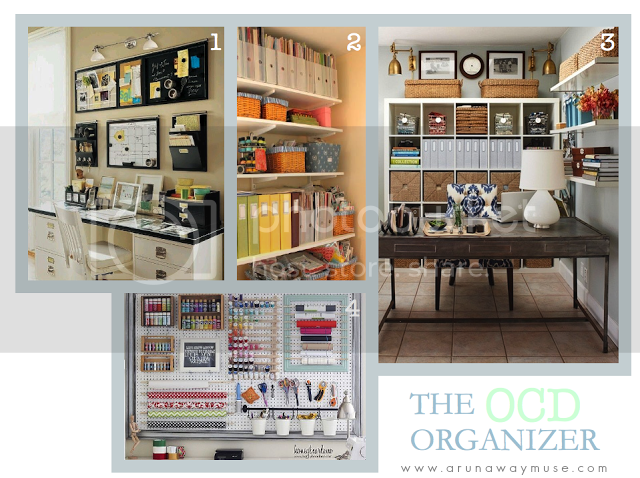 The OCD Organizer - the oft times frightening display of obsessive rainbow coordination and meticulous bookshelf storage. These people run the design boot camp for organization, and get giddy when they look at perfectly aligned magazine holders. The Organizer tirelessly categorizes every single item in their office and finds a place for it. They enjoy admiring their hard work by having everything in your face at hand, with all their glorious organization exposed for the world to see. But if you ask me, those who are organized are just too lazy to look for things. Another overload on the eye balls... I'm sensing a pattern here. I do not have the patience nor stamina to systematize my office supplies. I prefer to have a life. Translation: I prefer to spend my days laying out at the pool sipping a Corona or watching endless amounts of Netflix with a bowl of popcorn at hand. With such a demanding schedule, it's no wonder I don't find time to organize. The Minimalist - the ultimate form of self control. The Minimalist is an artist, painting the perfect picture of simplicity. They are pure in their design esthetic, only introducing pieces of necessity, requiring every single item to coordinate and flow together. If you ever need minimalist inspiration, look no further than Scandinavian/Nordic design, or my Tumblr. I have had many failed attempts at pulling off the Minimalist, so at this point I've pretty well given up. In conclusion, I've found that I'm none of the three radical Desk Etiquette's. I'm drawn to inspirations that have a little dose of all three mixed together in a delicious stew of office design. After all that dissection, I still can't figure out where I fit in. I would love to be able to keep my office space completely clutter free, but I do appreciate the slight pops of colour, a funky lamp, and an array of plush toss cushions. The colour palette I'm loving right now is cream, white, soft pink and gold. Gold has always, and forever will be, a design obsession of mine, and it would be simple enough to switch out the hits of pink when if I tire of it. 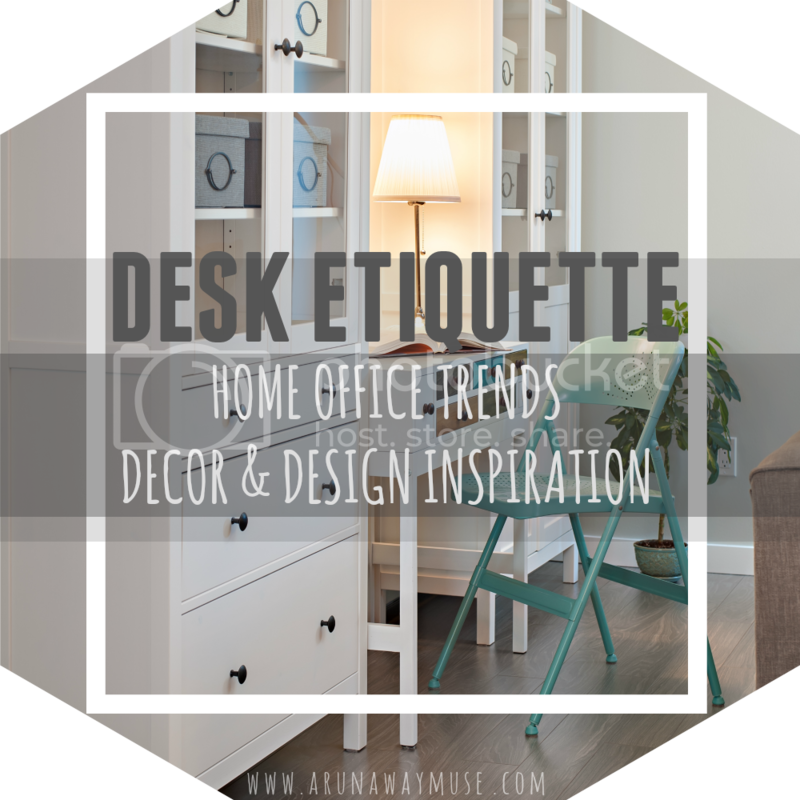 What is your Desk Etiquette? My desk etiquette would have to be the ocd. I can’t stand paperwork pilled on my desk. So beautiful pictures!It is hard to choose one to be favorite!Pls post more! Shall we follow each other? i love comment and browse blogs i followed! This is such a handy post! I just moved home from univeristy and I am in need of a huge reorganisation of my room! Your blog is so cute! 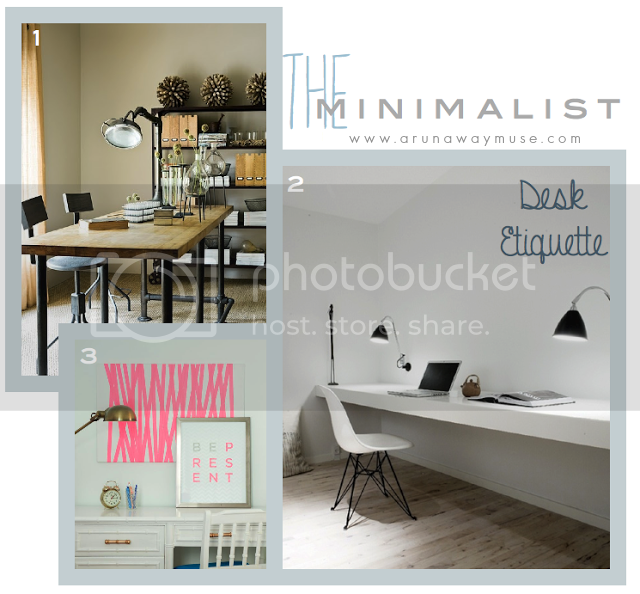 I adore all these desk inspiration photos! Makes me feel like giving mine a makeover! New follower from the Weekend Block Party! Right on thank you Jillian! Hey just stopping by from the bloghop :) This is a great review! As a non-Pinterest-user you made your explanations crystal clear. I'm now a proud follower and look forward to reading your future posts! I'm definitely a clutterbug! Thanks for linking up to the BlogLovin' Hop! I think I'm a mix of all 3! I will make our desk really cluttered, then organized, then hide and repeat! Its a sick cycle and Im constantly redecorating, but I love it! 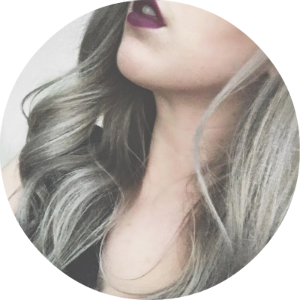 I love all your pins by the way, I have pinned a ton of the same stuff! :) New follower, great blog!! What a variety of wonderful office design ideas and inspiration. Whether you opt for this design or that, it is still important to adapt or choose something that makes people comfortable and more productive. Thanks a lot for sharing. Love this! 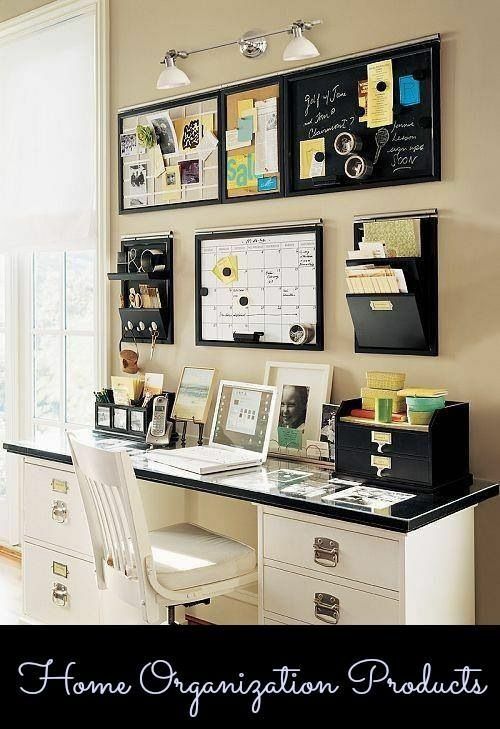 I'm constantly hypothetically designing my perfect home office and these look awesome!